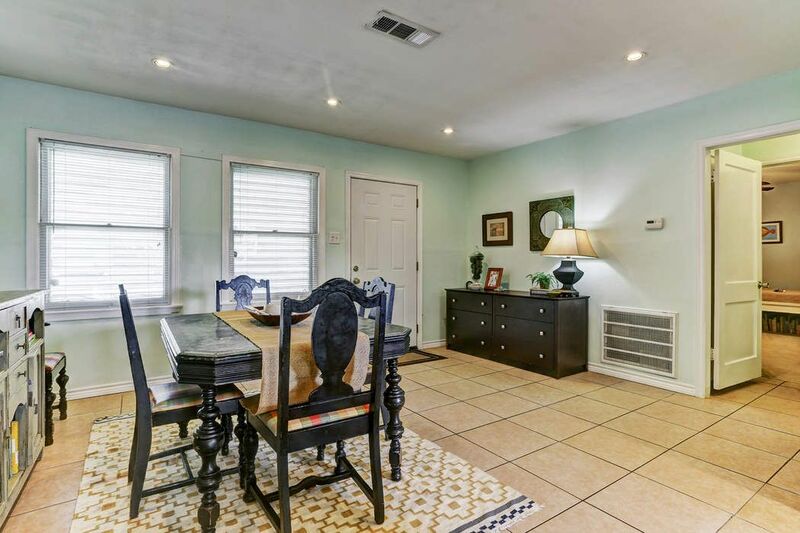 125 Bonita Avenue, Galveston, TX 77550 | Martha Turner Sotheby's International Realty, Inc. The divine dining room boasts imported porcelain tile flooring, recessed lighting and large picture windows. 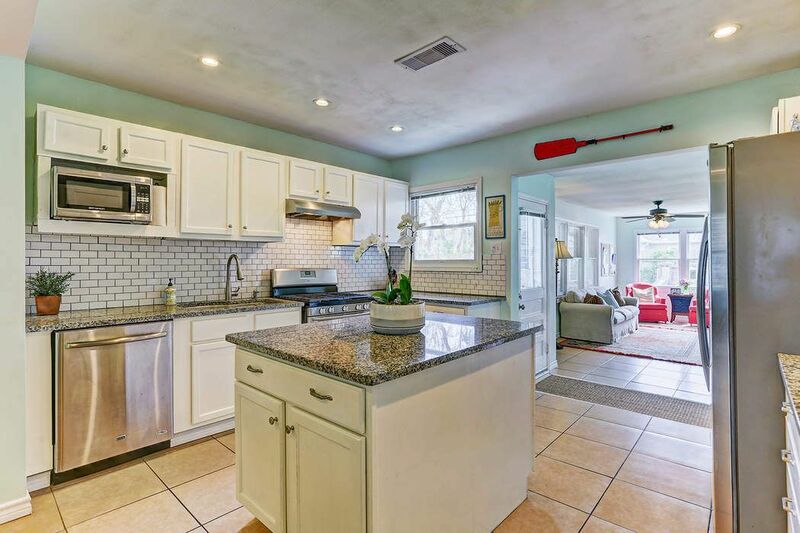 The open concept floorplan creates fabulous flow for island entertaining! 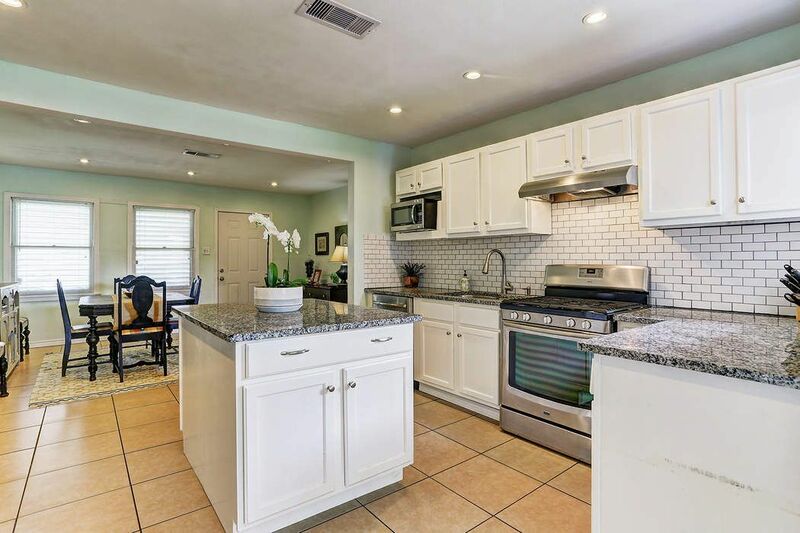 The stellar chef's island kitchen, which flows effortlessly into the dining and living areas, is appointed with upgraded stainless steel appliances (including a gas range), gorgeous granite and designer subway tile backsplash. 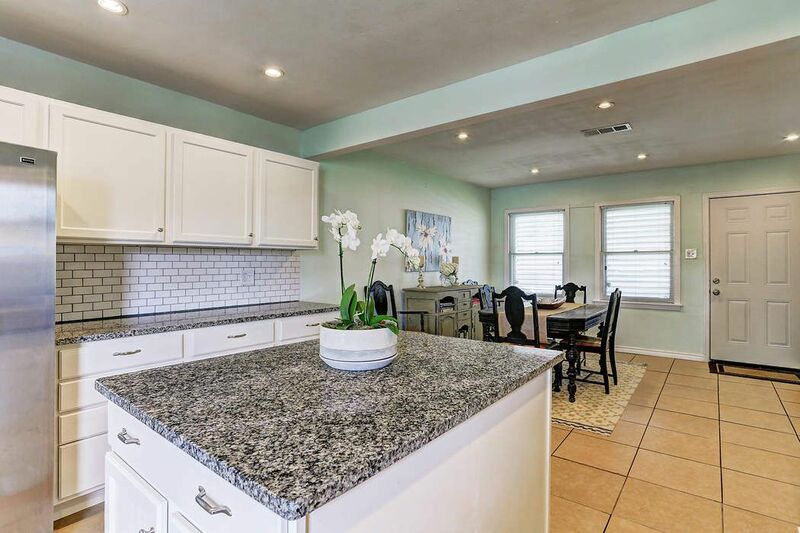 Note the elongated counters with ample space for a sumptuous buffet and the large picture window with patio and backyard vistas. Note extensive storage on both ends of the island, custom cabinetry and recessed lighting. Note designer drawer and door pulls. 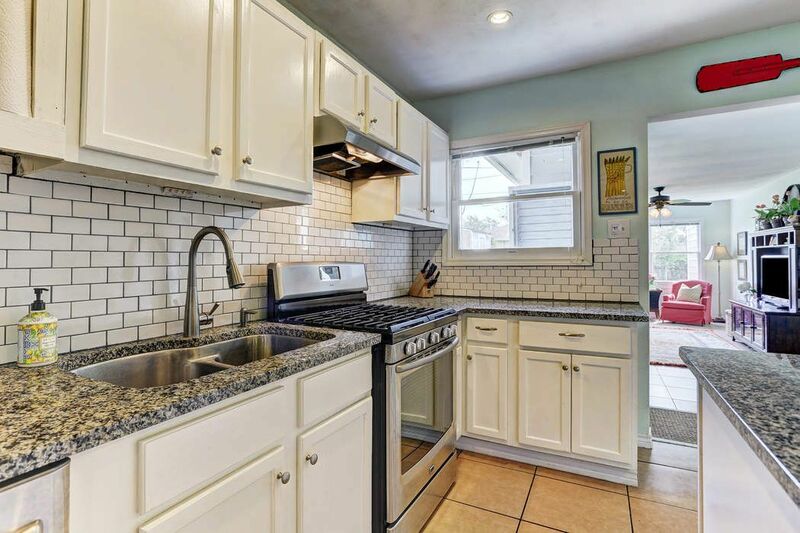 Note the oversized contour undermount sink with designer fixture. 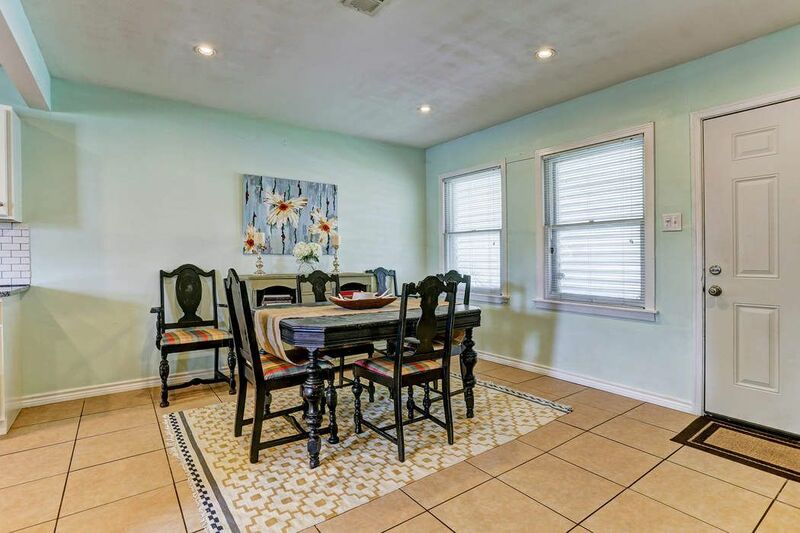 The spacious living room is distinguished by expansive wall space, large picture windows overlooking the flagstone patio and backyard gardens and porcelain tile flooring. An ideal place to relax and curl up on the sofa while watching your favorite shows on Netflix. 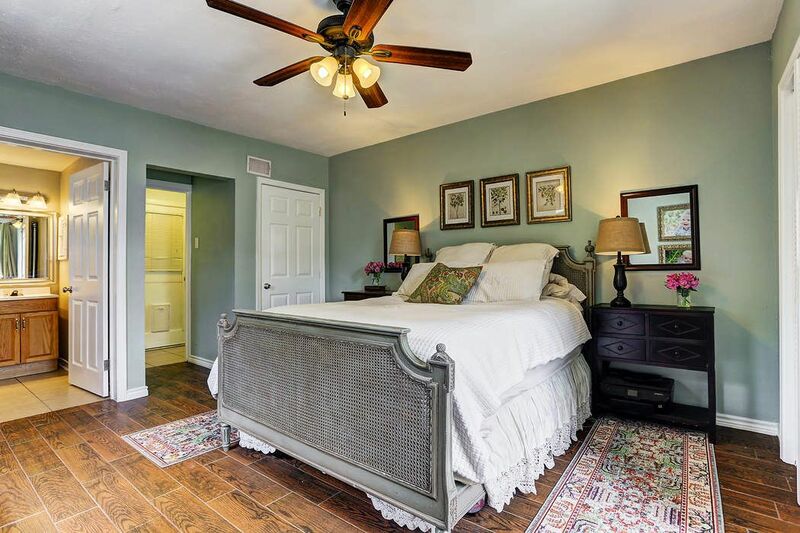 The captivating master suite is highlighted by gleaming "hardwoods look" porcelain plank tile flooring, "his and hers" closets, designer window treatments and a splendid window seat with storage. 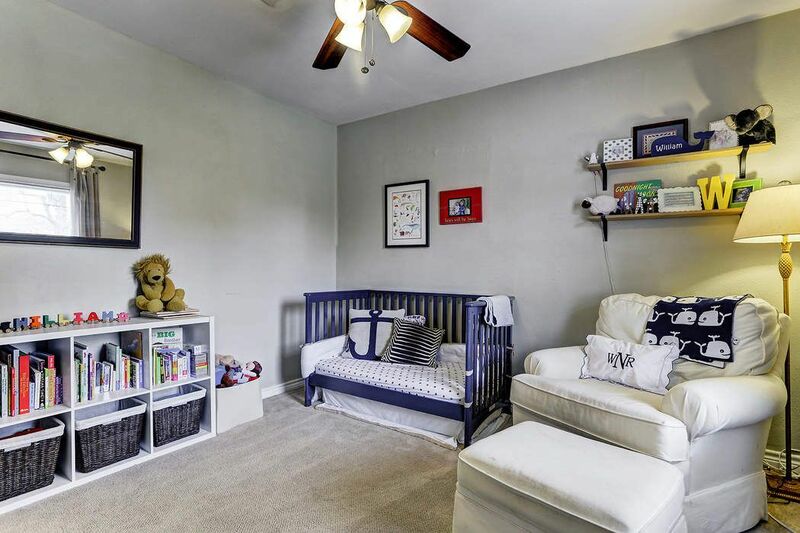 Note the soothing designer wall color and custom lighted ceiling fan. The luxurious ensuite master bath is enhanced by an oversized frameless glass shower trimmed with designer subway tile walls and mosaic tile flooring. 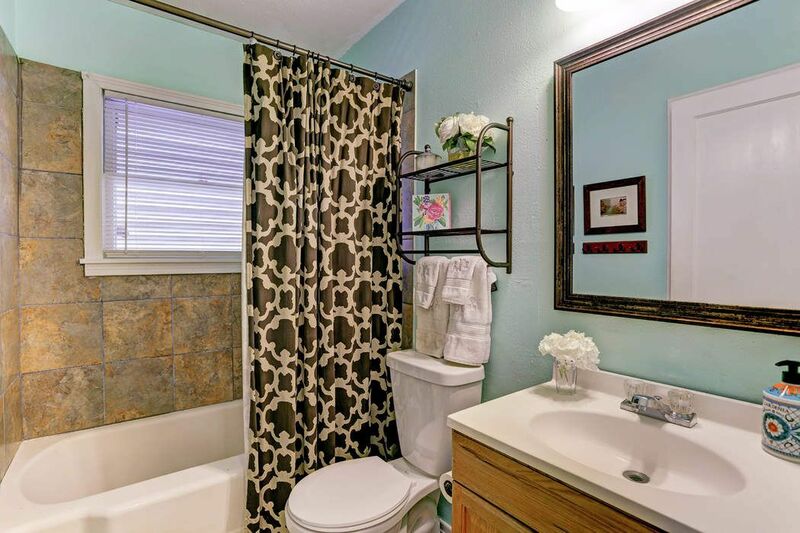 Note the designer framed mirror and fixtures. The spacious front secondary bedroom is accented by large picture windows and designer window treatments. 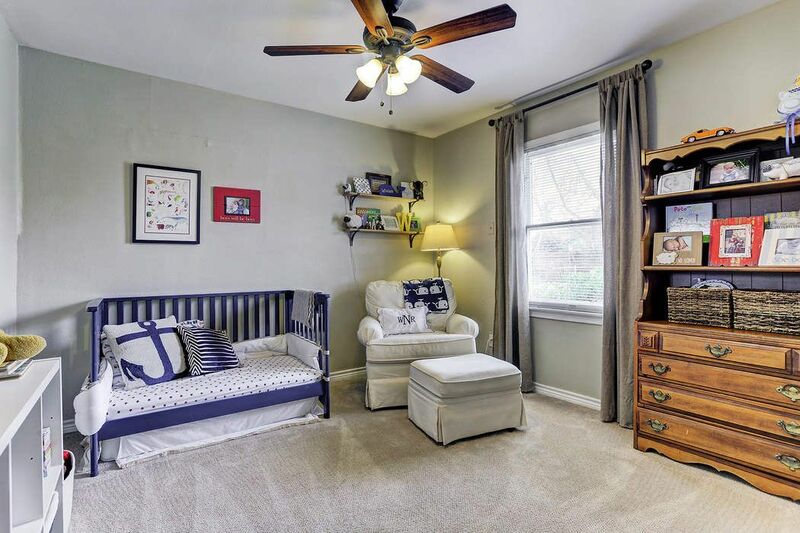 Note the designer wall colors and custom lighted ceiling fan. The hall guest bath features a "limestone look" porcelain tile tub/shower enclosure, a framed mirror and designer fixtures. 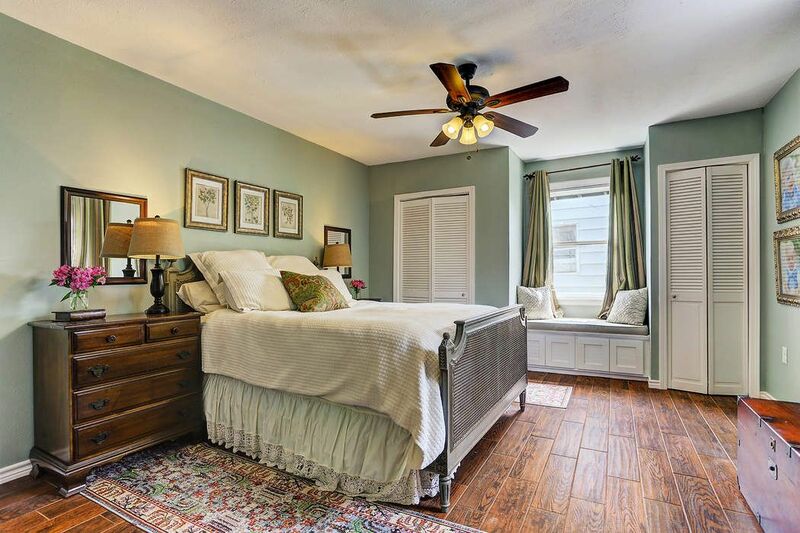 The back secondary bedroom is graced by designer window treatments and a large picture window with patio vistas. 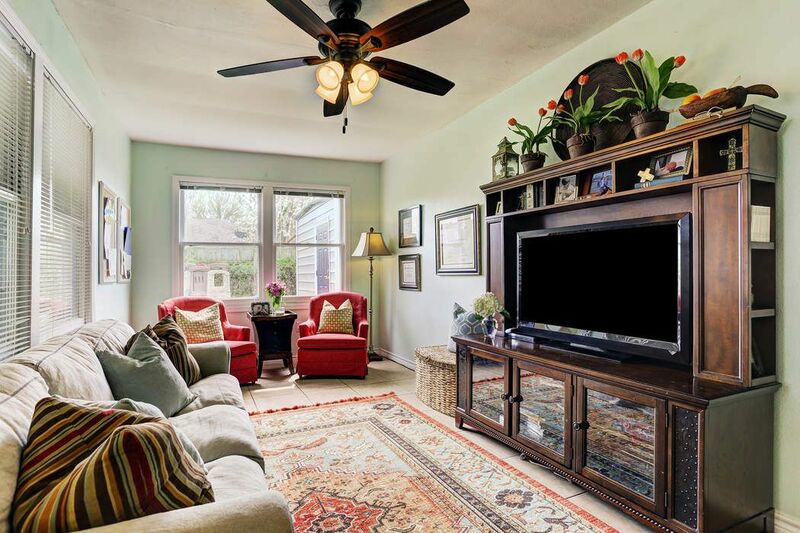 Note the designer wall color and custom lighted ceiling fan. Expansive backyard provides ample room for a sparkling pool. 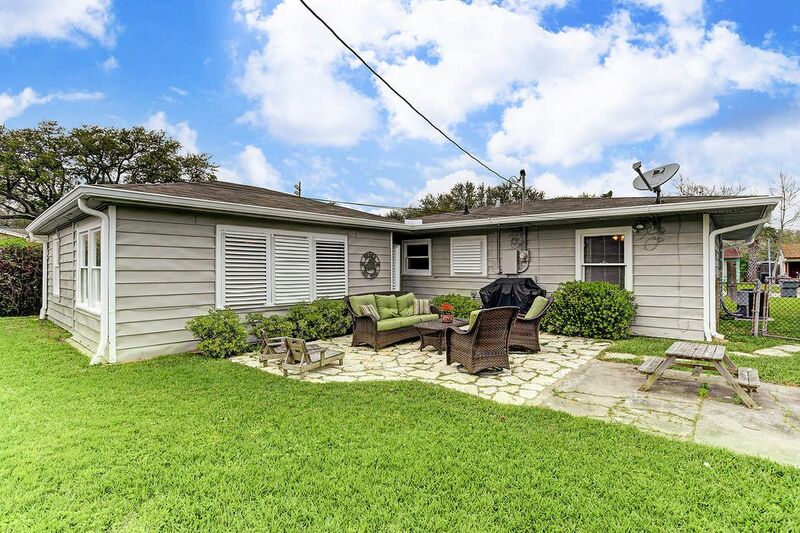 Note lush tropical landscaping & expansive flagstone patio. Savor marvelous margaritas with friends while grilling luscious fajitas! Note the large decorative brick planter brimming with beautiful tropical foliage. The large storage room could be utilized as a wonderful potting shed. 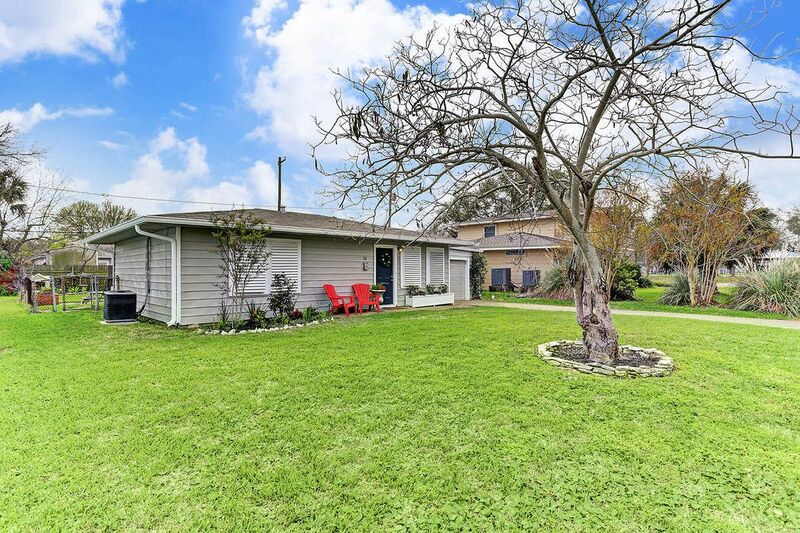 Note the sprawling lawn and the oversized attached one-car garage containing ample storage room and a full size washer and dryer (included). 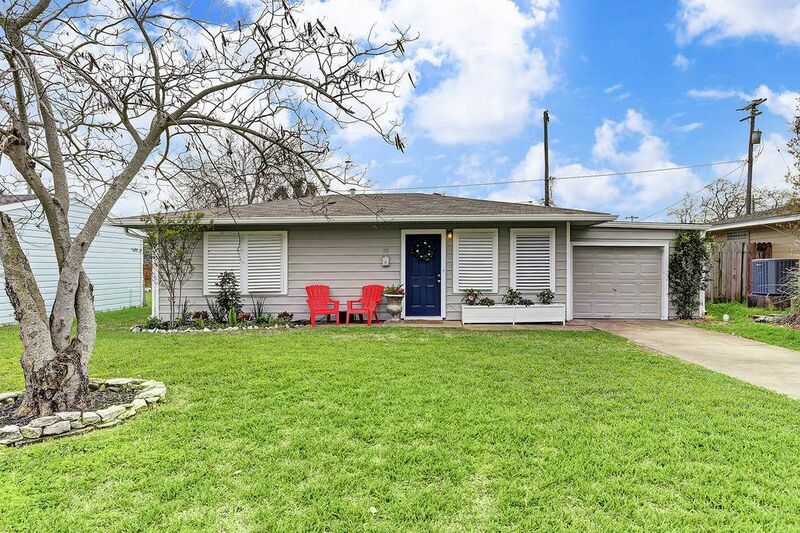 $198,800 3 Bedrooms2 Full Baths1,385 sq. ft. 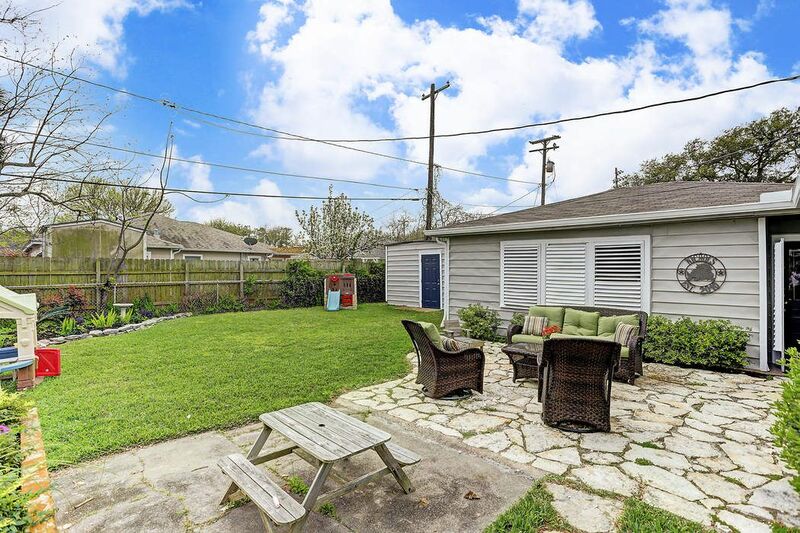 This captivating island bungalow is located in the heart of Fish Village- a coveted and convenient neighborhood adjacent to the acclaimed UTMB medical center. 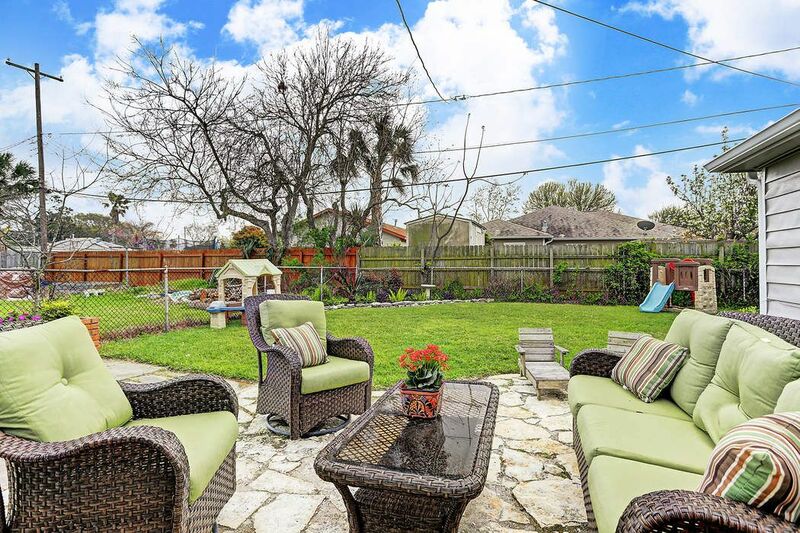 Lush tropical landscaping and an outstanding flagstone patio adorn the expansive backyard offering ample room for a sparkling swimming pool. The fabulous open concept floorplan is ideal for island entertaining with friends and neighbors! Exceptional decorator touches, designer window treatments, extensive recessed lighting and marvelous natural light fill every room. The outstanding great room complements the divine dining area. 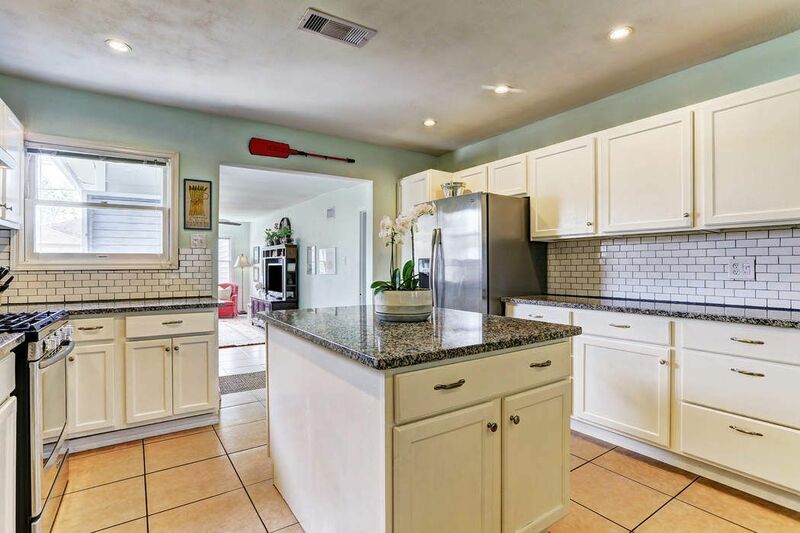 The superb chef's island kitchen is appointed with upgraded stainless steel appliances, gorgeous granite, subway tile backsplash, custom cabinetry, an oversized undermount contour sink and a picture window overlooking the sprawling backyard. 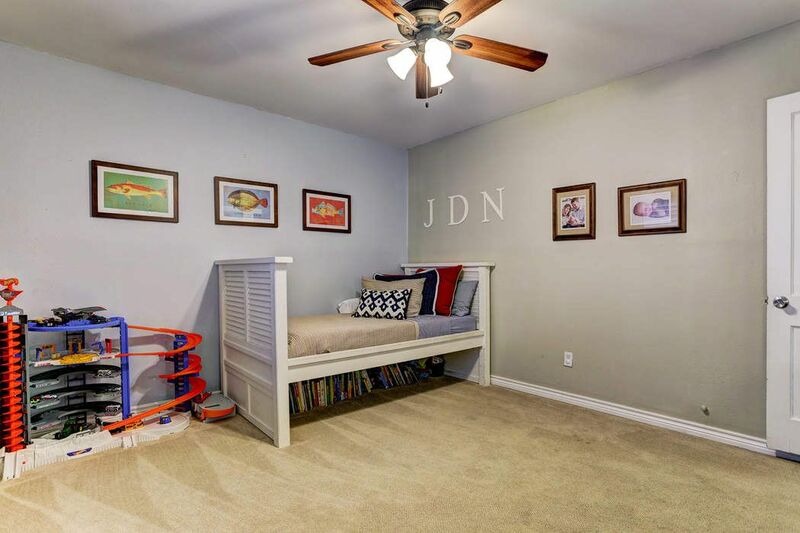 The stunning master suite is distinguished by gleaming handscraped hardwoods, a delightful window seat with storage, "his and hers" closets, a designer ceiling fan and a luxurious ensuite bath offering an oversized subway tile shower. 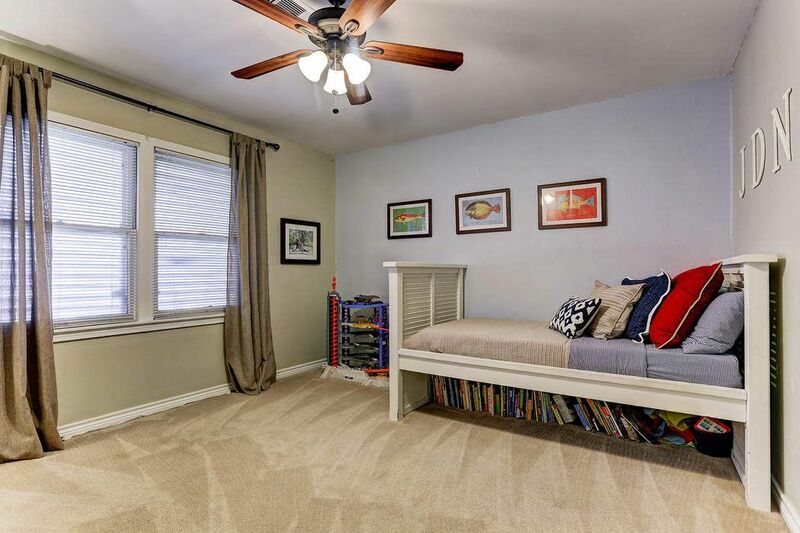 Two spacious secondary bedrooms boast large closets. 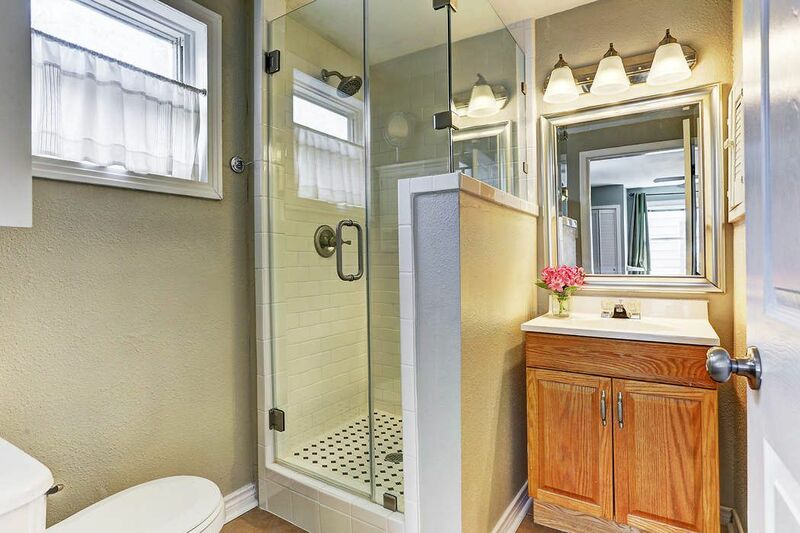 The lovely hall bath is highlighted by a designer tile tub/shower enclosure. The convenient attached garage offers a full size washer and dryer (included). 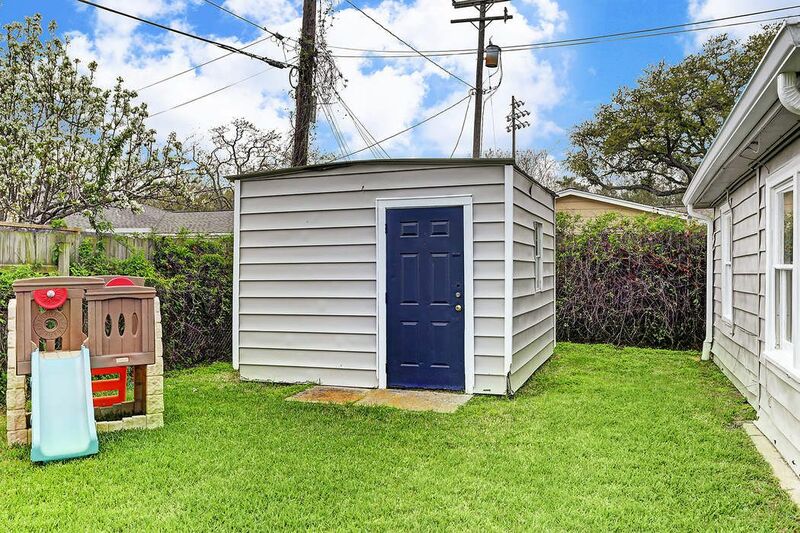 Large storage shed in backyard. 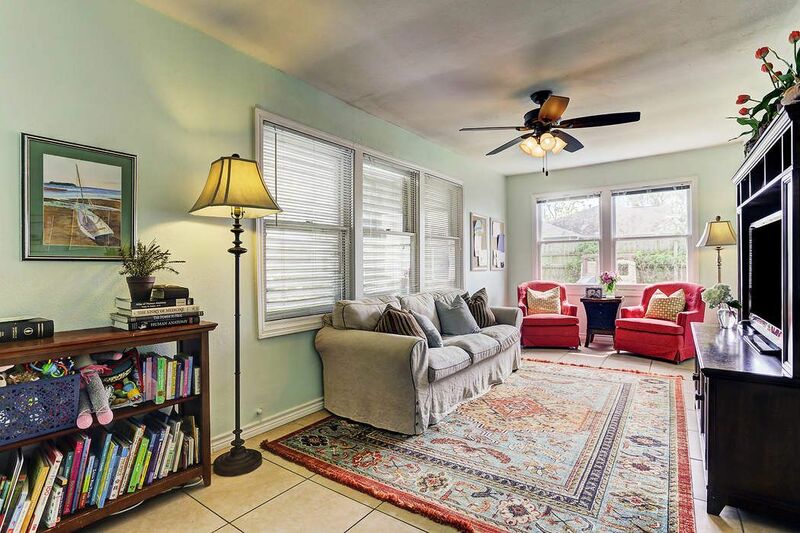 Only a short stroll or bike ride to UTMB and the popular east end beaches. 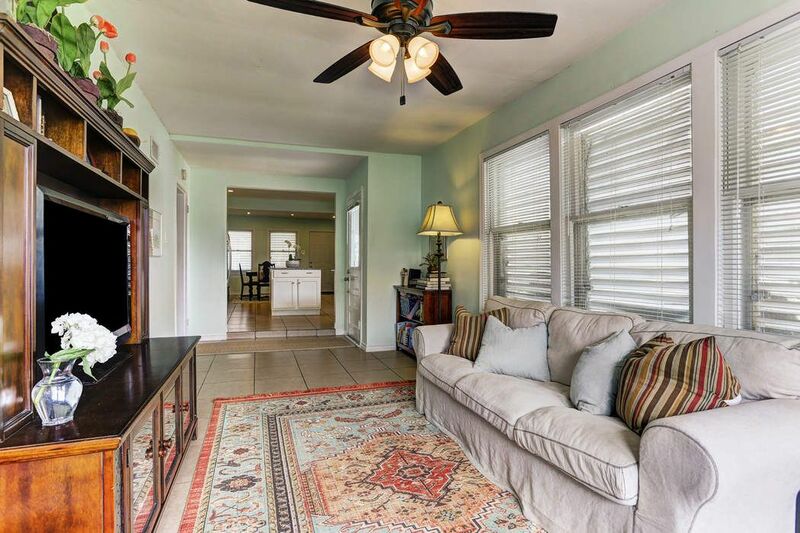 Only a few minutes to the downtown historic district and fine restaurants. Truly a special home!